Here are some of the questions we've had. 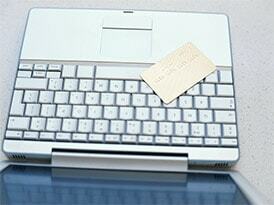 On the Premium site you'll find answers to over 400 questions. Including "What if ...?" QUESTION Hi Guys, I’m scared of flying, BUT I reckon I’m a bit different to most ‘scared of flying’ people. In that, I must have flown hundreds of flights in my life, everywhere in the world. I’ve travelled since I was 20 years old on business, and I’m now 55. I’ve been on jumbos, short haul, little twin engine aircraft, all sorts. I’ve seen and been on every type of flight….smooth, bit rough, very rough; missed approaches, go-arounds, even on an emergency landing. But I just cannot get my fear of flying from something I think is illogical, ‘stupid’ into a state where I know nothing’s going to threaten my life whilst I’m up there! I think my problem stems from the fact that I’m a bit of a control freak, ie when I’m driving or whatever, and I need to know that the same people flying me are as committed to ‘driving’ me as safely as I would myself.Several aspects cause me anguish during a flight. First is turbulence; I’ve been through some very rough turbulence on aircraft before, but I really don’t know what levels the aircraft can take before becoming un-safe.
! So, sorry to be a bit long-winded, but maybe I’m not alone. QUESTION My way to get through a flight used to be to get at least 3 double whiskies down me, then I was OK!! I realised this wasn’t a ‘fix’, especially if I had to drive at the arrival point. So mainly now I just suffer in silence, and personally monitor every small jerk, movement, announcement, or whatever during the flight. Can I be helped? Answer; Yes you can, of course. Drugs of any sort unless prescribed are not helpful in overcoming a fear of flying. QUESTION I was supposed to fly this morning for a break in Italy with my husband and son. We checked into a hotel by the airport the night before after forcing myself through my fear to go. I was overcome with extreme fear and panic whilst at the hotel and just had to get out of there – I returned home unable to board the plane. My fears of flying have become worst and more extreme, I have taken trains and boats to avoid flying. I really need help to overcome this extreme fear so where do I go – I’ve tried meridan tapping but this has not worked. Any advice to whom I should go to? User Comments: I wonder if you can help- I am not really scared of the mechanics or safety of flying more the claustrophobia and lack of control. I have sufffered previoudly with panic attacks and have avoided flying for 3 years I have a flight booked in 3 weeks time. My main concern is a sense I might completely loose control and on some flights I’ve had a sensation I want to open the door and jump out-I always worry about the poor cabin crew having to put up with me and what would they do if I did lose it? Answer; Despite what you feel, passengers almost never ‘lose it’. QUESTION Great website – I can’t believe I’ve never found it before!Just one thing – some of the video clips won’t play all the way through and, for a nervous flyer with high levels of anticipatory anxiety (flying on Sunday), the ones of take offs which come to a halt or stutter along until the sound (of the engines) cuts out as the plane has just taken off don’t do much for my confidence! I am in the state of taking everything, however irrational, as a sign that the plane will crash and I know it is completely stupid but these clips appear to be another sign. Answer; This is a browser problem and nothing to do with flying. It’s not a ‘sign’. Answer; Yes, our products are available from our shop and we send them worldwide. QUESTION Thank you very much for such a prompt reply. My fear of flying is getting a bit out of hand at the age of 25, so I thought I should deal with it now before things get even worse. Answer; The sooner you start the sooner the cure. QUESTION As a MD of a company I need to travel by air for business.Sometimes I cancell trips as a result of anxiety by getting of the plane before takeoff. Why is it that I tend to be more relaxed or travel easier on night time flights when it is dark? QUESTION I’m flying to tenerife on a 4 hour flight in 6 weeks an im petrified bout it,i went to liverpool on a half hour fligfht and it was horrible i hate doing it and 4 hours will seem too much and it doesnt help that i suffer panic attacks and anxiety.any tips? Answer; Learn diaphragmatic breathing routines. QUESTION JUST FOUND THIS SITE AND I’M WONDERING IF ANYONE CAN TELL ME WHAT TO DO. I’VE FLOWN WITHOUT FEAR ALL MY LIFE ALL OVER THE WORLD, THEN 2 YEARS AGO I TOOK BOTH OF MY YOUNG CHILDREN ON A SHORT FLIGHT AND GOT VERY ANXIOUS, AFTER THAT I WENT ON AN EVEN SHORTER FLIGHT AND PANICKED WHEN THEY SHUT THE DOORS AND ASKED THE STEWARDS IF I COULD GET OFF AND MADE A COMPLETE IDIOT OF MYSELF, IN THE END I DECIDED TO STAY ON BUT I’VE NEVER BEEN SO FRIGHTENED IN MY LIFE. I’M DUE TO GO ON A 2 HOUR FLIGHT ON THE 19 JULY AND I’M TERRIFIED WHAT DO I DO? ANY SUGGESTIONS? Answer; Yes stop calling yourself an idiot, you are no such thing, just anxious. QUESTION I’m not too bad – but, if I new more about the ‘science’ behind flying ie how on earth does something so big and heavy, full of passengers and their luggage : a. get off the ground and b. (more importantly for me !!) stay up there ??? Answer; The laws of science. Do you wonder why a boat floats? QUESTION I am scared of flying. I have fly a lot for work and out fo the country with my family but I am very nervous and anxious the whole time. I am very scared now becuase I have an amazing job opportunity to be promoted at my work and I have to fly for an interview. I am sooooo scared, because I have to fly all by myself. I HAVE NEVER DONE THIS BEFORE!! I have always had my family, friends, or co-workers with me. I have even paid for my friends plane tickets just so they would fly with me on my business trip so I wouldn’t fly alone. I’m so scared because they booked my flight for Monday…three days away!! HELP! Answer; Eventually you have to face your own fear. Having constant ‘support’ denies you the chance to show that you can do it. 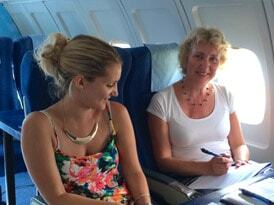 QUESTION Hi everyone, what a comfort to read I am not alone with my Fear of Flying Phobia! I have to fly to Auckland on Monday 16th July (for work) and I am terrified. The last time I flew (3 years ago) I had to be taken into the cockpit and reassured by the flight crew, I was such a mess! I sit in the plane very calmly, telling myself positive facts while doing deep breathing exercises BUT the minute I am off the ground INSTANT PANIC ATTACK. I stay in this state with two wonderful flight attendants holding my hands, until the wheels touch the ground again. I don’t want to have to feel this terror for an hour and 20 minutes. What can I Do? Answer; Stop re-enforcing your behaviour by describing things in capitals to start with. QUESTION Hi, Keith, thankyou very much for your reply,desperate to get husband on a flight in august that’s why i needed to know how long dvd would be.hope it works. Answer; If your partner is nervous , ask how you can help, don’t assume what you do is right. QUESTION I’ve had a fear of flying for many years and would be sick and running to the loo,my fears got worst when my mom died my whole life has turned upside down,I really need help to overcome this thank god for your web page I’m going to buy your DVD . Thank god Ifound the page. Answer; A significant life event is often the cause of, or aggravates a fear of flying. QUESTION Keith, I saw your DVD, very interesting. I think a sequel in the sense of ‘what if things go wrong’ would be useful too. I think there’s a group of fearful flyers that believe that everything is fine and works well (they don’t question the fact that airplanes can fly savely) if there’s no pilot error or technical defect. One thing you mentioned in your DVD was that maintainance is getting easier because computer are doing it for us. To me this is not really a relief because I know that basically every software has loopholes. Answer; A DVD of what goes wrong would be very short. QUESTION Thank you for replying to my email. I did look around the site, even downloaded two of the CD’s. Although I know a lot of facts now, still I feel very anxious to fly. I also have to deny to everyone asking me to go on a trip and try to justify myself. When people are not facing the same kind of fobia, they don’t really understand. I can’t even go on a trip with my boyfriend. That creates a lot of pressure on me. Answer; Tell your boyfriend how he should help you..he probably doesn’t know how to. Answer; Yes, by every measurable standard. QUESTION I am a very poor flyer (better than I was through some hypnotherapy!) but am flying this Friday morning from Manchester for the first time in 12 months. I have read teh book, but want to know if I can buy any of the items at the airport on FRiday OR if the CDs can be downloaded if purchased online? (I don;t have an IPod, but can get a CD player) P.S. Sorry this is so last minute! Answer; Airports don’t stock products about the fear of flying, they deny that people suffer from it and fly! Available online. 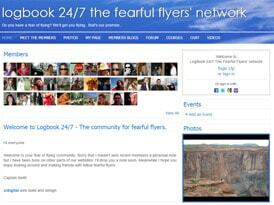 Answer; Look at the videos on LOGBOOK 24/7 the Social Network for fearful flyers. QUESTION keith, can you buy any of the videos that you show on your video clips. Answer; No, we’re happy to offer them free of charge. QUESTION I have to take a flight in 2 days from Chicago to Amsterdam and I find myself increasing and illogically afraid. I am particularly scared of flying over the ocean. How does a plan deal with an emergency when it’s over water? Is it less safe than being over the land? How would you do an emergency evacuation in water? I just need some positive information to help me calm down and stop thinking bout the worst case scenario. Answer; The same way as over the land. No. As we’re trained to do it. QUESTION Thank you so much for your reply. That helps a lot. I think a lot of my worries are just not knowing how planes actually work which makes the whole experience of flying seem unnatural and risky even though I know all the statistics say it’s perfectly safe. I do have some pod casts of relaxation techniques so hopefully that will keep me settled down. I’ll let you know how it all went. Answer; Knowledge will dispel the myths of flying. QUESTION hi keith, i wish i could come and visit you! i tried listening to a few sounds and read the facts but i already know most of it. the problem is that i don’t even try to get on a plane or be near an airport and i really want to see my husband fly the plane. he tried so many times and explained so many things to me but still i do not dare… we have a 4 year old, i do not work,we have all this free time to spend on holiday and we never ever went anywhere because of my fear. Answer; Spend your free time being realistic. It will take your husband 15 years to be as good as an average pilot. QUESTION In may I missed the opportunity of going into the outer arctic circle due to my fear of flying (although i have flown in the past, badly)i got as far as the airport and came home, this trip was a prize through work, now here i am again in turmoil i have won a comp to go on a chefs study tour of argentina (15 hours away) what am i to do? Answer; Start with small steps…arm yourself with knowledge. Answer; Read my book Flying without Fear and get the CD Set…that’ll explain everything you’ve asked. QUESTION One other question. I was looking at different stats and on the site and it stated it would take 100 miles for a Plane to Glide if it lost engines during the cruise. What size plane are we talking about? QUESTION Are there any courses i can attend in the west midlands area? How much does it cost? Why do i feel like i am the only person in the world, with this fear??? Answer; Because people get laughed at when they say thay have a fear. So people stay silent. Answer; Unfortunately we’re based in the UK but our shop will have things that will help you. And there’s lots of free stuff on this site. QUESTION hi,my brother lives in dubai, has asked me to go to his wedding in november.I want to go but i dont think i could fly ,when i think of it it makes me panic i am 59 years old,i will have a heart attack,but i want to go.I hope your site can help me thankyou. Answer; It’s very unlikely that you will suffer a heart attack. Deal with your panic attacks by breathing diaphragmatically. QUESTION Hi. My partner and son would like to go abroad however I have a dread of flying. I have had post traumatic stress in the past and am very anxious. I scored phobic on your test. Our holiday starts in a weeks time and I have booked nothing. Is it too late now? I have been on a BA flight course and cried all through the flight. I want to do it but just reading your website makes my heart race. Have you a PLAN you can suggest advice please? Answer; Allow yourself enough time in future to prepare…it might take months. QUESTION I attended your seminar in Winchester a couple of years ago now and came with you on a jaunt down the south coast along with your film crew. You will remember me as the one who refused to get on a flight to Cyprus at Millenium and vowed never to get on a plane again. I’ve not actually flown since the flight with you but am due to fly to Melbourne on 20th October. I’m feeling ok about the actual flight at the moment thanks to you and your team. However I have other things to worry about which is what I want to ask you about. In fact it may be your wife who can give more guidance on this as I recall her being a stewardess for a number of years. Along with my husband and myself will be my 6 year old and 2 1/2 year old. It’s a 23 hour flight departing at 22.15 with 2 hours stopover in Singapore. We’re flying with Singapore Airlines as we have been told by many people that they are a great airline especially for families. I’m not too worried about my 6 year old but am pertified about how my 2 1/2 year old will handle it. Do either of you have any tips on what I should take or how I should prepare. Also what should I expect? It is amazing how I have put my own fears to one side as I have my toddler to worry about. Any help, advice or tips would be most appreciated. Answer; Talk positively and excitedly about your forthcoming trip and make it seem normal. QUESTION On a one very tubulent flight, on landing the captain said “I don’t know about you I am glad to be on the ground, we have pushed this aircraft to the limit. What on earth did he mean? Answer; I can’t imagine …sounds like a very careless and stupid remark to me. QUESTION Hallo Keith Many thanks for your reply. I would just like to start a new post re. my flight that I have looming next Friday 28th. It’s only a very short trip to Jersey, Channel Islands but the thought of it is literally making me ill (waking at 4.30am, stomach churning, heart pounding, can’t eat, etc, etc). It’s not only the flight but it’s Gatwick that’s worrying me – it comes across as so impersonal and scarey ! I flew to Bangkok from there last year and got myself into the same state as then but much, much worse. I bought your book over a year ago and I have been reading it but I think to have some feed-back/general encouragement from other nervous flyers might help aswell. Many thanks once again. Answer; How did you convince yourself of the danger? What evidence supports this view? QUESTION I and my wife have never flown. About 30+ years ago I had trouble with my right ear and I am now deaf in that ear and use an hearing aid. The consultant at that time warned me not to fly But about ten years ago another consultant said it would be ok. I would love to go by air for a holiday but I dare not risk it. I wondered if there was some machine to see if I would be able to fly with out any discomfort or danger for me. Answer; A doctor can see whether you can fly or not with a simple and routine check of your ears. QUESTION I’m a very nervous flier i also avoided taking to the skies for a very long time i went on my first trip in june of this year to spain i took the plunge again this month and have just returned from malaga now my partner has booked up to go to gran canaria this saturday and im so scarred as the flights are getting longer also this time im taking my pregnant daughter with me so all the fears are back. thing is i know why im scarred…im scarred for my daughters saftey now where as before it was my own her unborn baby (my grand child)im not sleeping im thinking what if i never get to see my grandchild what if my daughter never sees her child if we all die the plain might crash or blow up i am also thinking im pushing my luck by flieing so close together once in june then at begining of october now at the end of october i no you will tell me im being stupid and i no i am but i cant stop these thoughts. Answer; You are not stupid. You are more aware of all the dangers in life but in fact nothing has changed except your anxiety. Answer; Cancelling this year’s flight will mean that you go through the same thing next year. QUESTION I am a very anxious flyer. I travelled 4weeks ago from Edinburgh to East Midlands and cried the whole time. I am due to go on holiday in 3weeks time to Orlando, this requires a 7hr flight. I thought it was reassurance that I was needing so I bought the ‘Flying without Fear’ book and reading it seems to make me more anxious. The flight ahead is almost unbearable to think about. I get Diazepam from the doctors but this has no affect. I am planning on taking sleeping tablets instead. I know this will not help me overcome my fear but in the short term will help. Do you have any advice that could help me get through the next 3weeks and the flights? Please. Thanks As two publishers whose work involves a substantial amount of international and domestic travel, we would like to thank you for the helpful information and advice contained in your book Flying Without Fear. We have both been nervous flyers at times, and this can be difficult when air travel is essential for one’s job. You just have to get on with it. After reading your concise and practical book, however, we both find we are able to fly with much reduced levels of anxiety. Answer; Facing your fear is something you have to do eventually. There is no other way. QUESTION We’re still not all that keen on take-off though. Are you absolutely sure the plane isn’t going to break into pieces? Answer; Of course I’m sure. Why should it? QUESTION I think I am always close to a heart attack on take off and when the plane is climbing. The only thought that enters my head is that the pilot hasn’t enough power to make the take off and he isn’t high enough to return to the runway. Help. Answer; Both of your thoughts are wrong. QUESTION I have had a growing fear of flying after several bad turbulence flights and need to overcome this phobia. Do you offer this seminar in NYC? Answer; I’m sorry to say that we don’t run courses abroad . We are based in the UK. However try our shop for our other products. QUESTION Do you have any resources available or success stories about overcoming a fear of flying that isn’t about the saftey of the aircraft but a fear and terrible anxiety that exists by just the thought of being trapped in the confined space of an aircraft for any length of time and having no control over being able to get off or move about freely and turbalence. My fiance wants to go to Madeira in March which is a 3.5 hour flight and I’m terrified at the thought. Answer; Don’t be terrified, face your fear. Where is the evidence for what you think will happen? Answer; Any exposure to flight conditions will help her. Our course would be suitable. QUESTION I’m 29 years old and I have never flown because of my crippling fear. I have cancelled so many trips in my life because the fear takes over my mind, and my life. I am claustorphobic and I also have a tremendous fear of “I can’t get off the plane”. Once I am up, I am commited to that flight. I am so afraid I will flip out and won’t be able to get off. If I were on a bus or in the car, I could easily take the next exit. I am not afraid of heights at all and surprisingly, I don’t fear plane crashes. Answer; The fear takes over… change that so the facts take over. QUESTION I could have very easily lived my life without flying. Of course I would have missed out on so much, but I would have managed. My boyfriend lives in England and I desperately WANT to go see him and his family. He has come to America twice and it’s my time to go there. I thought I might be able to make the flight if I had someone with me but it turns out, I don’t have a travel buddy. It’s me, solo. The idea of taking off and landing almost excites me because it does look kinda fun…It’s the whole commitment thing and what happens if I NEED to get off the flight. I don’t ride elevators…I suffer from anxiety attacks…I honestly feel like I can’t do it but know that I must conquer this. For myself, for him, for our relationship. That’s my story…any words or advice would be so helpful. Answer; Conquer your fear by facing it. Answer; Read all the facts from this site and get some of our help products. QUESTION Can you tell me when your helpcast on flying in turboprops will be available? I’m contemplating a flight in a 30-40 seater prop but have very unhappy memories from flying in ATPs a few years ago, when they did seem to be incredibly rough and turbulent!! Answer; It’s available right now. QUESTION I just blew off an important biz trip because I could not get myself to stay on the plane. I want to know where I can find in-person support groups in Union County, NJ, or in NYC. Thanks. QUESTION Hello- thanks for your help to those of us suffering this type of anxiety. My issue is: I am not scared of taking off, landing or noise. My big anxiety is more of a claustrophobia because of the lenght of the flight. I have friends in Spain who have offered me free miles but I cant go because I think to myself, if it is 13 hours what do I do on the 4th hour when I am starting to get anxious for the flight to be over feeling like my lungs are not getting enough air etc? My church group is also going to Africa and this claustrophobia is limiting me because it is also a long flight. Basically I can not take flights over 4 hours. Is there any help for people like me or does your video only cover help with fear of noises, landing and takeoff? please let me know. It would be life changing to get help with this. QUESTION I am due to fly out this friday at heathrow terminal 3 to thailand. I am worried as its a night flight 930pm. Should i expect any turbulance as its a night flight? Answer; No more than during the day. QUESTION I’m travelling with Eva airways havent really looked into their history and flight details. I am a nervous flyer and i feel that nobody can help. My g.f just tells me to get over it and stop thinking about it but obviously i can’t. As soon as i sit in the seat and prepare to take off my eyes, hands and body start to shake and sweat. i feel embarased to ask a member of the cabin crew that i have a problem. I would like to download some audio to aid me while im on this 13 hour flight to thailand bangkok from London. Answer; Tell the airline, check in and crew about your fear. How will they know otherwise? QUESTION G’day from Sydney, I would like to know that how dangerous is turbulence during storm? My fear of flying has taken deep roots in me. I’ve got your book (must re-read it! ), numerous audio-recordings, I’ve taken hypnotherapy sessions with a few therapists and I interrogate every pilot or crew member I meet – nothing helps! Recently a friend of mine’s said that for him there’s no difference whether he’s in a car on a bumpy road or in a plane in turbulence. And I thought that the feelings are really similar and if I manage to experience turbulence in safe environment, I may be able to overcome my fear. I am terrified by turbulance. are we in great danger whilst going through turbulance? Answer; Turbulence is uncomfortable but that’s not the same as dangerous. Keep your seat belt tightly secured. QUESTION I know the procedures in landing with crosswinds. But I think sometimes limits are pushed to much (like in LH in Hamburg). I could be on that plane. Getting into clouds seems to be like crossing a wall, or an unknown world. I hate being tossed when the plane gets in, I hate not seeing anything between clouds, and image that there is probably a mountain or other plane around. I know, I know. TCAS; ILS….but I can´t keep my mind away from this bad ideas. When I see the ground, I just breath. If the planes bounces, and there´s crosswinds, I am just scared to death. I am sure I wil never overcome it, but I am trying to live with it, and always find alternatives. Thanks and congratulations for the website. I apologize for my english. I am a Spanish speaking person, so I might have made some mistakes. Answer; The limits are not pushed. Stop imagining things and use facts instead. QUESTION We were flying around a thunder head and I was listening to the pilot speak to air traffic control. I think the word he used was “mada?” After, air traffic control asked him if he was back from “direct mada” or maybe it was “nada?” This was on approach to San Francisco airport. It was on the planes sound system! The pilot invited us to listen along on our head sets. It was really neat and helped alot with my anxiety! Answer;Nada / Mada is probably a navigational point and may have been part of the re routing of the aircraft because of the weather. QUESTION Dear Sir, I wouldn’t dram of even thinking about booking a flight. My worst nightmare is dreaming I’m on a plane. Just thinking about flying is a no no. I t takes me ages to get anywhere as I live on an island Malta, in the middle of the Mediterranean. QUESTION im due to fky to valencia on 08 apr im starting to panic and its too late for a course what would you advise im worried about recent news about fumes in cabin affecting pilots near miss stories and terrorism am tempted not to go so would appreciate your help 1.How does it land on water? 2.I have heard a plane can glide if all engines failed, is this correct? 3.If it can glide would it glide straight away or would it drop several feet first? 4. Can the undercarriage still come down if there is engine failure? QUESTION Dear Sir I have read your book, fear without flying, it has helped me to some respect but im still having problems with the take off. Im fine throughout the entier flight even when there is turbulence, but the take off scares me. I get all nervous my hands start sweating my heart starts beating really fast and all my muscles in my body are tense. I listen to every single sound the plane makes and look out the window. Could you please help me or give me a tip of how i can overcome this anxiety with Take offs. I would really appritiate it very much. Answer; Watch our videos about take off at least 20 times. QUESTION My son has recently developed a really bad fear of flying, he has in the past flown to Florida and back, twice, he has flown to Spain a few times and also to London. My son is 14 years old and is extremely anxious about flying now. This is stopping me and my family from booking a holiday abroad as he gets himself into a right state, when we mention flying. Please advise if this course would be good for him. Answer; Yes it would help him. QUESTION I am planning a trip and just cancelled it because of my anxiety – 4 months before I board the plane. I want to rejoint the trip. Can you recommend the best course. QUESTION I am going to Majorca in 20 days time, we booked back in January & it has been on my mind since then … I will only fly with one certain airline but our outward trip is late at night, is it just as safe to fly at night ? Answer; Just as safe. Why would it be otherwise? QUESTION I AM GOING TO PAKISTAN ON JULY 5TH THIS YEAR AND AM TAKING BOTH MY CHILDREN AGED 12 AND 9. I ALREADY SUFFER FROM VERY BAD HEADACHES AND ALOT OF NAUSEA THROUGHOUT THE DAY EVERYDAY AND AM PETRIFIED THAT THE PLANE WILL ROCK,TURN UPSIDE DOWN THEN EXPLODE IN THE AIR.EITHER WE WILL BURN TO DEATH OR FALL FOR A LONG TIME BREAKING TO PEACES.PLEASE COULD YOU GIVE ME SOME ADVICE.THERE ARE SO MANY PILOTS WRITING BOOKS AND SELLING DVDS HOW DO I KNOW THAT BUYING THESE PRODUCTS THAT THEY WILL REALLY WORK? Answer; Because they have worked for thousands of other people. QUESTION I am flying to New Zealand from Manchester on 28th June and already I am worrying about the flight. I don’t like it when it is bumpy and I am sure something is going to happen. It is always what if this, what it that, I am already uptight and my stomach is turning all day please help. Maybe the facts about turbulence will help. QUESTION p.s may your website keep going well! QUESTION I suppose you get emails like this all the time…but it makes me feel better when i write this sort of stuff or type it in this case! Will i ever enjoy flying again? I used to love it and really enjoy the airport and everything but since i was 18 (now 25) i have been terrified and it is getting worse!! I am going on holiday two weeks today and all i can think about is the flight…which is only about 8 hours in total of the whole hoilday. I feel so angry with myself and trapped. Please help?! Answer; Don’t feel angry…get on and do something positive! QUESTION I have been very scared of flying for last 3 years. It got so bad I would always consider walking out of plane or scream if thought in danger. Following the Madrid crash it made my fears worse. Im flying very early morning from Basel to London City airport on Saturday on Avro RJ100. Are these small planes safe? I hear it is going to be very windy is this affecting the plane on landing? QUESTION Hi Keith, Thank you so much for answering my email, I really was not expecting a personal reply this quick. I tried to change my flight for a direct flight from Cairo to New York, but was unable to find any this week. So I guess I’ll just have to fly with Tarom and hope for the best – if you say they’re fine, I’ll just put my trust in you. I’m sure people tell you this all the time, but it is scary when there have been no less than three plane crashes in the past few days (Madrid, Kyrgyztan and Guatemala) – I really can’t see how this could happen so often? I just don’t feel like ever getting on a plane again. When I get back to the states I’ll get your DVD’s and perhaps they will be helpful despite my fear. Answer; Statistics don’t say when things happen…just the chances of it happening. QUESTION I guess I am less worried about terrorists than technical issues, and the pilots ability to handle such issues. Should I tell the flight attendants about my fear or would they think its silly? QUESTION Thankyou so much for replying, Just to give you a quick insight have no issues with a planes flying or the take off or anything about crashing etc I developed serious agoraphobia and flying is part of a group of things that have become an issue for me, these include trains, buses, underground, traffic jams anything where escape would be hard, and the thought of being trapped fills me with terror, this is where my problems lies. Does your course help with people like me who have these types of issues, I flew until 2001 where on a flight back from Barcelona I had a slight panic attack and have avoided ever since. Answer; Yes the course will help you. QUESTION I have flown my entire life all over the world,even as an unaccompanied minor from South America to the UK and never felt afraid. In the last 2 years I have been terrified and it has got to the point where I literally feel I am not going to survive the journeys. All my family live abroad and I really want to overcome this sudden phobia. I am flying out to Gran Canaria in October and do not want to have to cancel the flight. I normally travel with BA but am going with easyjet and am already in a state of total anxiety. Please can you help? I am normally bad at take off and better the rest of the flight and I thought it was safe during the “cruise” part of the journey but since the Ryanair scare with the depressurising of the cabin I am even more scared.How did that happen? I seriosuly think I would be a hysterical wreck if something like that happened and there was no announcement from the pilot.I dont want to put off or frighten other passengers and will do anything to conquer this fear. I look forward to hearing from you. Answer; Develop a strategy, take small steps, accept set backs, get information, learn thought stopping routines. QUESTION I have an intense fear of flying that holds me back from going anywhere. it is mine and my partners dream to travel america but we cant get there as i cant get on a plane. Last time i did i took two valium and it didnt even touch me, i screamed and cried the whole wat to spain, tried to get off and then panicked the whole time about coming home. coming home was even worse, two hostesses had to stay with me the whole journey. Im not scared of airports or planes, im quite happy being in the airport so lnog as im not on the plane. Im terrified of the plane crashing and dying. Everyone says they dont fall out the sky/crash, but they do and have done recently. I torture myself watching programmes that investigate air crashes which only reaffirm my fear. Im not scared of heights or speed. I hate the noises, i hate it when it goes quiet, i hate any movement on the plane, not just turbulence, any movement which is unavoidable. I hate that this controls my life but dont know what to do? Thanks again Keith – you should be very proud of your work and the invaluable service you are giving.